I am not vain enough to assume that you, dear Internet, actually have a vested interest in my life and keep track of what happens in our little corner of DC. Most of you probably just check in from time to time to see if we have babies yet, because we all know that that is when blogs get really interesting, and I am a full 1-3 kids behind most of the people I graduated with, not to mention before. Sorry all, no babies. But in case you have been on pins and needles since I announced my wisdom tooth plight a couple weeks ago, I wanted to provide an update on my operation and subsequent convalescence. Because what good is a blog if I can’t whine about the first world luxury of modern dental care and the miracle that is Jello? When I mentioned on here that I was concerned about who would take me to have my teeth pulled since James would be gone, I was so touched by the outpouring of support. So many people texted, emailed, called, Facebooked, etc. to offer to look after my drooling self. Even though I have only been James-less in DC for a week after being in Kentucky, I feel so blessed by the friends that have looked out for me. My procedure was on the easy end of the wisdom tooth spectrum, as my bottom ones were pulled in high school and the top ones had come all the way in and just needed to be extracted. Thus, I was only knocked out for about 20 minutes and the oral surgeon predicted a speedy recovery with no fear of dry sockets and no need for those squirty bottles that clean out the wound. Just me, a lot of bloody gauze, and some rocking pain pills- none of that noble silent suffering without meds for me. Our sweet friends Laurie Anne and Taylor came with me and played babysitter throughout the morning. I am thankful to them for filling my meds, driving me home, setting me up with Netflix, yogurt, water, and generally making sure I made it. But I am most thankful to them for filming my drive home. Since I wasn’t out long, I wasn’t totally out in the car ride home. Instead, I was just ridiculous, opinionated, and very, very chatty. Admittedly, this isn’t very different than my usual state, only plus narcotics. I remember having pleasant conversation, but when Laurie Anne sent me the videos, I was astounded about the passionate opinions I shared under the influence of medication. Were I a person with less self-respect, no plans for a career, or a desire to have a humiliating video go viral, I would share the videos here. If you are someone who actually knows me, feel free to text me if you want to see them. As for you, dear Internet, I will pass on some transcripts and spare you the truly unattractive gauze-swollen face and bad breakout I had going on. 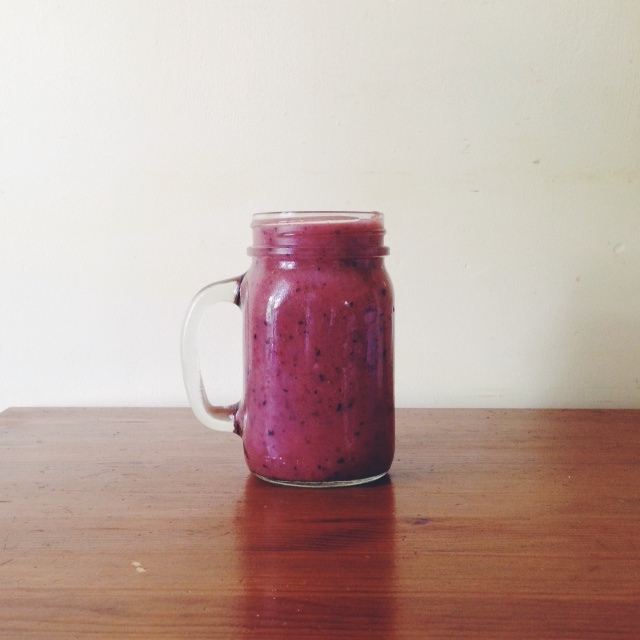 Don’t worry – this amazing fruit smoothie was consumed without a straw. And made from three day-old fruit salad because that’s how we roll around here. After a morning of snoozing and TV, I felt pretty good, and deeply amused by my earlier commentary. It appears that my drugged-up alter-ego is a tooth selling thief with a fear of God and black labs. Good to know. Really, this convalescing thing is kind of awesome. I am eating all the foods I usually don’t permit myself (read: runny Kraft mac-n-cheese and lots of strawberry Jello) and I am burning through various TV series. I discovered just in time that season three of Call the Midwife was about to expire from PBS and so I have been blazing through all the episodes, cringing at the seemingly very real representations of 1950’s birth in London’s East end. Seriously people, I’m all about women having the freedom to give birth where they want, but every time someone tells me they don’t want a hospital birth because they are just “so sterile” I think…. isn’t that how they are supposed to be? Sterile. Clean. Shiny. Count me in. Now then. Back to convalescing. In his absence, James hid a gift card to a local gelato shop in our bookcase for me to find. I’m planning a big outing today for some creamy goodness. I might even change from my pjs and wash my face. Maybe. Wouldn’t want to push it. No sense in rushing recovery. Anyone else have crazy wisdom teeth/ any other surgery stories? This entry was posted in Uncategorized and tagged daily life, rants. Bookmark the permalink. It was TOO MUCH. I finished it just hours before it expired and I was wrecked. The mother thing got me. Also, does this mean no more???? That maybe wrecked me more than anything else. Love that show! I can’t even WATCH Call the Midwife. It makes me absolutely terrified/crushed about all the dead babies/danger that moms might die/general fear and I’ve actually given birth so I know it’s not that bad. And wisdom teeth removal are the worst (even worse than when I got my gallbladder out) but even worserrrrr is when husbands are gone. It’s the pits. Though, did the pills give you dreams? I had dreams every single night that I could fly. It was awesome. Ok, I’m glad to hear that childbirth isn’t as traumatic as it looks on TV! I haven’t been having crazy dreams, but now I reallllyyyy want to fly in my sleep. Oh my goodness. What I wouldn’t GIVE to watch these videos. I can’t believe that terrible nurse wouldn’t let you keep your teeth! I was allowed to keep mine. I still have it in a keepsake box somewhere which is pretty frightening, but hey, it’s a memory? I’m sorry that you had to endure that while your husband was gone but glad that you have friends to help take care of you. Also, please come visit. Please and thank you. You got to keep them???? JELLY. And yes, how can we get someone else [work, school, etc.] to pay for us to actually meet up and become non-internet friends? This needs to become a top priority. Because friendship. And donuts. I informed the nurse that her hair was cute, even though there were two of her… And then I just looked like a swollen, green-tinged chipmunk face after that. Call the Midwife is FAB. And made me cry so SO very much! Must admit, I was glad that I waited to watch it until AFTER giving birth to my baby girl in March… My paranoid, hypochondriac brain would’ve felt any sad/dangerous episode was an omen. The minuscule part of my brain that’s rational would’ve said, “Pish posh! No need to worry” in Chummie’s (Chummy?) voice, but the crazy prego hormones would’ve shrieked objections. Yeah… I don’t think I could watch it if I was actually giving birth sometime soon. UNLESS I COULD HAVE CHUMMY BESIDE ME AND THEN I COULD DO ANYTHING. I agree — it is pretty traumatic and could totally freak me out if I was pregnant.